When it comes to value, the best road hub option is generally something from our own brand components. These hubs provide the best value for money and most, but not all of them, are based upon Bitex hubs. 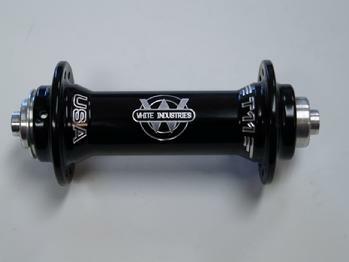 Bitex hubs are made in Taiwan and are the finest example of a performance focused value hub. They have very good bearings and a reliable. Their precisely machined and carefully optimised hub shells are an excellent foundation for a wheelset. They use a strong, durable and easily serviced ratchet system. The range is extensive so there is a hub for every occasion. They are the ideal choice for alloy sets between £250 and £600 or carbon wheelsets from £700-1200. If what you want to treat your wheels to a more exotic hub choice; either higher performance or higher finish quality, there are a number of other, premium options worth considering. With such a choice of hubs, it is easy to become confused. Each hub is different and they are designed for different riders and for different purposes. There are sometimes valid reasons to pay more for a heavier hubs – there are many metrics for what makes a good hub. Confusingly, manufacturers love using keywords like durable; lightweight; high performance and so forth. When reading the various descriptions of each, such phrases provide little insight into their key differences. Here we show you where each of the manufacturers excels, so you can choose which hub suits you best. One of the biggest benefits of hand built wheels is that you can customise the wheelset. You choose the components which best suit your needs and riding styles. Is it worth spending lots on a hub(set)? A well made hub should outlive the rest of the wheelset. With hand built wheels, these hubs can be rebuilt into new wheels. This allows you to retain much of the value of your original purchase when building up a new set. Hubs have a profound impact upon the performance of a wheelset, so a good hub is a good investment. Component parts of the hub may wear but can also be replaced individually. The following hubs best suit riders who are looking at spending over £500 on a pair of wheels. All of the hubs featured cost over £350/pair, generally most high end sets start at around £700. The hubs themselves have different maintenance requirements but, however for all hubs avoid contact with degreasers/cleaning products. Degreasers clean out the bearings and ruin them once they run dry. Similar avoid the use of pressure washers. We have separate information on how to clean your bike carefully. The following article works through the different hubs in price order, extolling their various virtues. There are a number of manufacturers out there who we have not chosen to stock for a number of reasons. One of the reasons is overlap, however it may be that we have some concerns about the product. The range on offer here should be able to make a wheelset suitable for anyone. Availability: 20, 24, 28 and 32h front. 24, 28 and 32h rear (Shimano/Campagnolo) made in Switzerland. DT Swiss do also offer a 350 hub, which is an interesting, considerably more economical hub. Given the slightly limited availability on the hubs and the excessive weight of the front, I would consider this a mid-end hub and not relevant here. However it does have most of the features of the 240s, so if you like those features, want to save money and do not mind about the extra weight, they make a great choice. All DT Swiss hubs are Shimano 11 speed compatible. They also all come with their patented Star Ratchet system. The Star Ratchet system differs from a conventional pawl system. It is similar to the clutch system used in Chris King hubs and two separate toothed rings revolve around each other and engage when twisted clockwise. It has been developed to provide very low drag, high reliability and durability and low weight. It is a system which can handle more torque and it puts less strain on the freehub/hub shell as there are no expanding/compressive forces from the design. The engagement as standard is only 18t. They do offer a 36t and 54t upgrade. The faster engaging systems are louder, have greater drag and reduce their durability. The hub is assembled/disassembled in a tool free way as end caps simply pull off. The ratchet system can only be fully removed from the hub with a proprietary tool. While the headline weight of the pair of these hubs is good. The weight of the front is actually letting the weight of the rear down somewhat. The flanges are fairly standard in terms of size between both hubs. The flanges are slightly smaller in diameter to some of the other hubs here, although fairly standard, the holes are larger than some but the flanges are thick which is a good feature. The front being larger than you normally find on a high end hub which accounts for the extra weight. The front hub does have a 17mm axle which is good for stiffness – the rear has a 15mm axle which is slightly less good for stiffness but it does allow for larger bearings. The bearings are fairly inbound in the hub which makes them less stiff, as does the push axle interface, however they used high quality bearings and a double shielded system providing probably the best sealing I have seen on any hub. 240s hubs are hubs you do not need to worry about, there is no preload. Assuming you do not cover them in degreaser, they should not require any attention until your rims are worn and require replacing, then a basic service should suffice. The rear flanges are a little smaller than standard which is perhaps where the weight saving has come from and will be less good for delivering torque. They come with alloy bodies and alloy axles which is another key way they have saved weight. Front hubs are suitable for radial lacing. The tension disparity between drive side and non-drive side is as good as you can expect to get really. I think the look of the DT hubs is fairly unremarkable. A larger drive side flange would have been nice but would have added weight and not improved longevity or reliability which are the key features of the DT hubs. Overall a great hubset if all you want is a hubset that is light, strong and just works. Campagnolo bodies are possible on Royce hubs, however they are £10 extra and they require a lockring at an extra charge of £30. You can see straight away that the Royce hubs are the heaviest in this line up. However this is for good reason and quite a deliberate decision. Royce hubs were previously lighter than this by around 30g, however the weight has gone up since they changed their rear axle and bearings to allow for bigger bearings and a stronger/stiffer axle at the back. Royce hubs use the largest bearings listed here. They also have the heaviest axles. The axles themselves are barrel shaped to increase strength and stiffness. The front axle is made from titanium, the rear axle is made from 17/4 which is a very strong type of steel. They use NTN bearings in their hubs which are not actually bicycle wheel bearings but are designed instead for machining. They are very well sealed and very durable. However they are, particularly given their size (6001 at the rear), fairly heavy. The axles on Royce hubs come with a lifetime warranty. The freehub bodies are made from titanium, like White Industries, however there is less machining on this version. The titanium as before helps to keep the weight down but resists bite. The titanium/steel axles have been chosen for strength and stiffness given their profile. DCR Wheels is actually helping to design an Ultra Light rear hub from Royce. This will still use a titanium freehub body, a titanium axle again, smaller bearings and a different shell profile. They will be available in black with an engraved logo. They should weigh around 370g/pair, bringing them much more in keeping with the rest of the line up. They should be available in 2014, we are taking a list of interested parties. 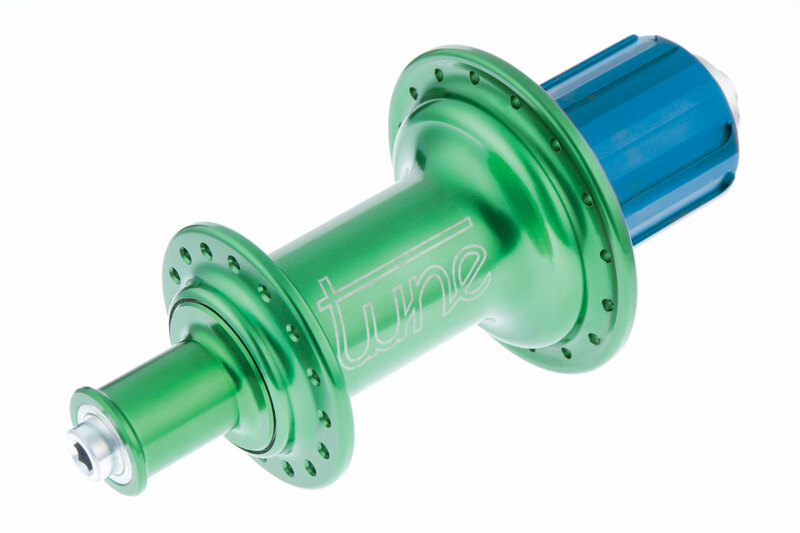 Royce hubs are the only option in this list that is made in the UK. Longevity and strength is an obsession when it comes to Royce hubs and they require among the lowest maintenance of anything in the line up. Occasionally you will need to grease the pawls and it is best to do this with the lubrication system designed by Royce (available at DCR Wheels). Royce hubs are ideally suited to heavier riders, as well as riding who regularly cycle in harsh conditions and riders who do very high mileage. The drag on the NTN bearings is higher than most standard bearings, however that comes from the nature of the sealing on them. They do break in as time goes on and you can opt for non-contact seals if you wish. Inboard bearings on Royce hubs come with non-contact bearings as standard, outboard hubs come with contact bearings. The hub shells are made from 2014 alloy. Normally shells are made from 6000 series aluminium which is a standard series. Generally 6061. 7000 series is sometimes used; this is stronger but also harder. The hardness can actually cause problems because it does not mold around the spoke as well and it is more brittle. It is often used when shells are heavily machined to keep the strength up. The 2000 series alloy used by Royce is stronger than 6000 but not as hard as the 7000 series. So it is a fair compromise to gain strength overall. The hubs themselves are not heavily machined and the profiles are quite curvacious which helps with durability. Hubs are not suitable for radial lacing. White Industries hubs have a lovely finish to them. They have a real feel of hand craftsmanship about them. The logos are engraved into them. They come in a black finish or a high polished silver finish. They were developed as an 11 speed capable hub. The spacing on the flanges is nice and wide at the front. The flanges are significantly different sizes at the rear. A large flange on the drive side has helped keep the tensions more even at the back and help prevent wind up. The smaller flange on the non-drive side saves weight. They come with a cro-mo axle at the back which is an unusual choice for a high end hub but steel axles are naturally stiffer than aluminium. The steel itself has been heavily machined and then capped with aluminium at the end, to keep this weight penalty to a minimum. The axle comes with a preload function. The front axle is alloy which is doubtlessly chosen for its weight saving. The freehub bodies are made from titanium but part of the body has been machined out behind the splines to save weight. Titanium is a lot harder than aluminium, so these bodies are a lot more resistant to bite. Titanium is also considerably lighter than steel, so the weight is kept down over using that as a material. Axles can be different sizes, so using a steel axle does not need to add as much weight as a freehub body does, where the external shape is already pre-determined by the cassette. The bearings are larger than some other hubs improving the stiffness and carrying capacity of the hubs, especially at the rear. Front hubs are suitable for radial lacing. Longevity is built into the philosophy of White Industries and is taken seriously by them. However, bearings are an item that you can expect to replace more regularly than other hubs. They come with a low friction Enduro bearing. The hubs provide very little rolling resistance. As part of this low rolling system, the hubs provide only external shielding and no external sealing. So the hubs are better suited to fairer weather. The reduction in seals has reduced the drag on the hubs, making them ride very nicely, especially when couple with the wide bracing angle at the front and large flange and steel axle at the back with large bearings. They also have gentle leaf springs in the freehub, which is designed to be used only with lighter greases or perhaps even just oil. The gentle springs make a quieter sound and put less wear on the pawls, they also reduce the drag. Given that there is a preload on the hub; this does need to be adjusted periodically. They have been making hubs for a very long time. They are one of the oldest manufacturers here and over the years most of their hubs have been track of freewheel hubs. They have sold a range of touring and tandem hubs as well and lighter road hubs has been their newest venture. Campagnolo and 11 speed shimano hubs as well as alloy axles and bodies are new to 2015. So these hubs are both, in essence, very old and very new. The traditional Phil Wood formula was essentially to use quality components, work with them to a high tolerance, over engineer them and build yourself a hubset that will last forever. Phil say themselves that their new ‘pro’ hubs have a lower rider weight and are less durable, however it is a lot lighter. They would prefer you to have a stainless steel freehub body and steel axles. Steel is stiffer for an axle and given that this is the largest steel axle used, it is fair to say that Phil Wood make the stiffest axles of all. Similarly when it comes to freehub material, steel is the most durable, it resists bite best and if you are using a pawl and ratchet system (as Phil do) then it will be the most durable there too. They use a very high quality ABEC 10 bearing. That’s right, ABEC 10! Essentially because they can and they have worked with a bearing manufacturer to do so. So, the key question is, when would you choose Royce and when would you choose Phil Wood? Phil Wood are made in the USA, Royce are made in the UK. That is likely to be a major factor. Phil Wood make more hubs, so you may choose Phil simply because there isn’t a Royce option that works. They make more colours for example, more axle interfaces, more drillings and more designs, they actually make more designs than any other manufacturer here. They also use steel freehubs, so if titanium is too soft for you, that may be your preferred option. Phil hubs are quieter when they freewheel. They also have 5 pawls not 3 and they are bigger pawls as well. Double row. The Phil hubs also have larger flanges for stiffer wheels. So, what about downsides over Royce. Well, they just use a standard steel axle, whereas Royce is 17/4. They also use a steel body which is heavier than titanium, you can see that in reality, the hubset weight is comparable, however what is being compared there is the new Phil hub with the alloy axle and body. So the Phil hubs are normally heavier than Royce. Also, Royce hubs have bigger bearings with a bigger carrying capacity – in a way, that is a bit unfair, as the ultralight Royce hub has smaller bearings than Phil but the mid flange and titan hubs have larger bearings. The main concern I have about Phil over Royce is Royce use 3 coil springs on their pawls, whereas Phil use one retaining clip/spring for their pawls. That does make freehub removal and servicing easier, however it does mean that the engagement of the pawls relies on their shape being in tact and just one spring. It makes the Phil system quieter than the Royce system, however I prefer individually sprung systems like those used by Royce, Tune, Bitex to those retaining clip/spring system as used by Fulcrum, NovaTec and (on some models only) – Powerway. If you wanted something that is tough and durable but did not want a hubset as heavy as Phil or Royce, DT and PMP are probably your best options as each of those have no real maintenance programme. Chris King is exceptionally durable and tough, however there are higher demands from maintenance. For those of you skimming this, you will notice from the headline that these are among the lightest hubs in the lineup. You will also potentially notice that it is the rears in particular that help with this. Although the 71g front is by no means heavy. The 178g rear is achievable through a combination of a very machined shell and freehub body, small bearings, oversized and thin, unthreaded axle and a titanium engagement mechanism. The mechanism that Tune use is probably their most unusual features, with the rest being found in a similar way in the Carbon-ti and AIVEE hubs. The titanium mechanism uses two different titanium alloys which have dissimilar molecular shape/size in order to ensure they can durably pass over one another. There are three pawls which engage simultaneously which means each of them shares an even burden of the overall load. Each component can be reduced down accordingly as the load is distributed more evenly and consistently among a great number of components. This design is now well proven and is a key part of Tune’s success. The shells are both forged and machined out of 7075 aluminium. This ensures that the molecules are aligned fanning out of the flanges to maximise their strength. The spoke hole drillings are 2.2mm, which is the tightest fit of any hub. The tighter fit helps to improve stiffness, as does the oversized axles and flange spacing. The freehub bodies are a very special material, a blend of titanium and aluminium helping to guard as much as possible against cassette bite. Alloy carriers on cassettes are still recommended (i.e. an ultegra or dura ace cassette). The hubs have a 0.2mm tolerance in their assembly which is absorbed when a quick release skewer is applied. This allows the hubs to run freely without risking over preloading the bearings. It is also a push fit assembly which does away with the need for a thread which adds weight as more material is required. The hubs can be fully dismantled but it is not recommended that you do this at home. The best thing to do is look after the hubs but also leave them alone. Keep degreasers and water displacers as well as pressurised water away from all of their seals. If your drive needs degreasing, remove it from the wheel before doing so. The front hubs have rotating flanges which ensure perfectly alignment. the 20 and 24h incarnations are specifically designed to be laced radially at a decent tension. If you are a sub 95kg rider looking for the best level of performance from your wheelset possible, Tune is probably going to be your best option. The actual limit is around 110kg. You probably have not heard of Alto Cycling. However, these hubs are seriously special. To start with they are all made in Sarasota, USA. They use exceptionally high quality NSK bearings and weigh a humble 315g/pair. I always think when it comes to a line up of exotic hubs it is easy to look at them and just go for the lightest. It is a nice way to flatter the wheelset weight and light-weight components always impress, at least initially. However, I like to think as weight as like a budget. You probably have a target budget overall for the weight of your bike and you can spend that budget in various different ways. I never like to see a component that is unnecessarily heavy simply by poor design, so if I see a high end hubset that is not exceptionally light, I normally question the virtues of spending the extra weight budget on the hubset. What do you get for that extra few grams? Is that a feature you may be interested in? It can go the other way, the lightest hubset design is rarely the best, often it means less material, smaller bearings, less stiffness, less practicality, lower rider weight limit, increased flex. 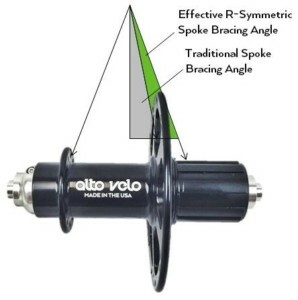 Alto’s brief was absolutely to build components that are suitable for elite level racing. So certainly they were looking for hubs which performed very well indeed. However their approach was a little different. They did not want to simply make the lightest wheels possible if they felt it compromised them costing their performance. They saw a few grams here and there as irrelevant in the real world and sought the performance in other areas where most manufacturers fall down. They wanted to be genuinely innovative and deliver better performance through a different approach. If you look at the breakdown of the hubset weight, you have 85g front, 230g rear. Certainly not heavyweight – light by most peoples’ standards. However, if you compare that to Tune; 71g and 178g for f/r, you can see that the additional weight is really found at the back, not the front. Adding 52g at the rear but just 14g at the front. If you look at the design of the rear hub, you can see why. The hubs use a very high / low flange design to create a huge disparity in the flanges. This disparity helps to offset the disparity you naturally find in a rear wheel because of the dish created by the cassette. It means that the flange diameter which on most hubs is somewhere between 48mm and 55mm on the drive side rear is actually 100mm. The design is taken even further by the lacing pattern that Alto encourage but do not insist that you use. They suggest 2x lacing on the non-drive side but radial lacing with the heads in on the drive side rear. That lacing pattern forces all of the drive side spokes even further out – as far out as they can possibly be. It also means that the spoke itself is much, much shorter than it would otherwise be. So for example on their CC56 (carbon clincher 56mm) rim, the drive side spoke length is only 218mm. If that had been one of our standard road hubs the spoke length would be 256mm. That shorter spoke reduces the spoke stretch and also reduces the spoke weight. So some of the weight you gain in the rear hub you lose again in the overall wheel. My initial concerns were that this design would lead to flange failure, a harsh ride and loss of torsional stiffness. However, it appears my concerns were misplaced. Firstly, the hubs were comprehensively simulated prior to their production; they were designed on the basis of no rider weight limit, so the flanges are certainly engineered to be very strong indeed. In the real world and after a few years of riders putting them through their paces there have been no failures, so no need for concern there. As for a harsh ride, well that is much more easy to discover – riding these hubs myself and lots of very positive rider feedback have confirmed that actually quite the opposite is true. The hubs themselves provide a significantly enhanced ride quality. The stiffness increase is very noticeable when riding and when building and the increase in the bracing angle improves the ride comfort. In fact I would say without question, these are the stiffest hubs I have ever built with by a margin. Finally, testing done at Alto shows that where the non-drive side tensions are now significantly higher (at least 25kgf higher we have found during building). This more than offsets the torsional stiffness loss on the drive side. So rather than being torsionally less stiff, they are actually torsionally more stiff. Although the torsional stiffness increase is less pronounced than the radial stiffness increase. They also have a 4 pawl design, each pawl has three teeth, they go inside a ratchet with 48 teeth making for a 144pt effective freehub engagement or 576pt possible contact points depending on how you look at it. The upshot of which is, however you look at it, you get very fast freehub engagement and very fast pickup as a result. Finally they use an unusual but innovative axle design, this design allows for the minimum possible loading on radial bearings for very good bearing life, no need for regular adjustment and to allow for particularly good rolling resistance. For details on maintenance, please view here. 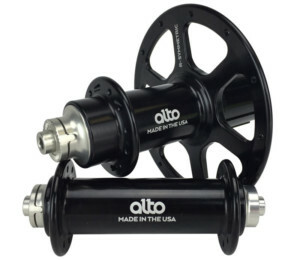 So, in summary, what would I say about the Alto hubs? Well, they are clearly made to a very high standard. I like that they now use radial not angular contact bearings and I think that their latest axle design which enables this is a definite improvement. Their ride quality is beyond reproach. I cannot really see any way that they can realistically save any weight in the hubset without abandoning the R-symmetric design or their unlimited rider weight limit but I appreciate that there will always be those out there looking for something lighter. The R-Symmetric design does limit their drilling to 20/24 symmetrical which means they do not work with all rim options. Finally, being the price that they are, there will always be those who question the need to spend this amount on a hubset but if it were me, I would choose Alto hubs over Chris King for ease of maintenance and improvements in stiffness/ride quality reasons and over DT Swiss simply because they are more special and they perform better. They are clearly among the very best hubs we offer and I think that anyone who has £550 to spend on a hubset should seriously consider these as an option. Availability: 20, 24, 28, 32h front, 24, 28 and 32h rear. Campag and shimano. Many colours. 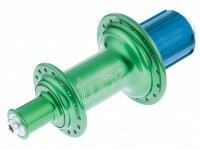 The R45 is a revision of the classic Chris King hub. Instead of having 72 points of engagement, it now only has 45. The result is lower drag and less weight. The shell has also been redesigned. All Chris King hubs come with their unique, patented Ring Drive system. This allows for faster engagement than conventional system. It also offer surprisingly low drag and it is a lot quieter than most fast engaging hubs as there are no pawls. The sound of the hub is quite different, more of a whurring sound rather than clicking. Chris King is the only manufacturer in this line up that makes their own bearings, even the balls within the races. The bearings themselves are also different in design. They are angular contact bearings (despite being removable and replacable sealed cartridge units). They offer a very high static loading capacity. The axles are made from aluminium and so is the shell of the freehub body. All this has been done to help keep the weight down. There is machining on the non-drive side rear to keep the weight down. Chris King obviously decided against a high low profile. The sizes of the flanges on the rear are unusually large, which helps with even tensions and wind up. The front hub again is fairly chunky and much heavier than the rear when pitched against other hubs. The front hub is suitable for radial lacing, however Chris King like this to be undertaken only by professional builders and specify a lower tension limit on this. The size of the shell is probably required given the size of the bearings and the 5 year warranty on it. The angular contact bearings offer low drag, which is particularly noticable under loading. They are also the only bearings that come with a 5 year warranty, along with the rest of the hub. The 5 year warranty is conditional that regular checks and maintenance be carried out on the hub. The bearings themselves need to be loaded (this can be done with basic tooling) and improper loading can cause premature failure. The capacity of the bearings and the more positive feel that you get from the ring drive combined with the low enertia of these hubs makes them among the highest performing option in the line up. You will notice this as soon as you ride them. However the downside is that they will require more regular maintenance than some other hubs. A complete strip down is recommended every 6-12 months and to do this you will need to use the R45 maintenance kit. If properly maintained, they will last a long time, so a diligent rider will have a high performing pair of hubs for years to come. 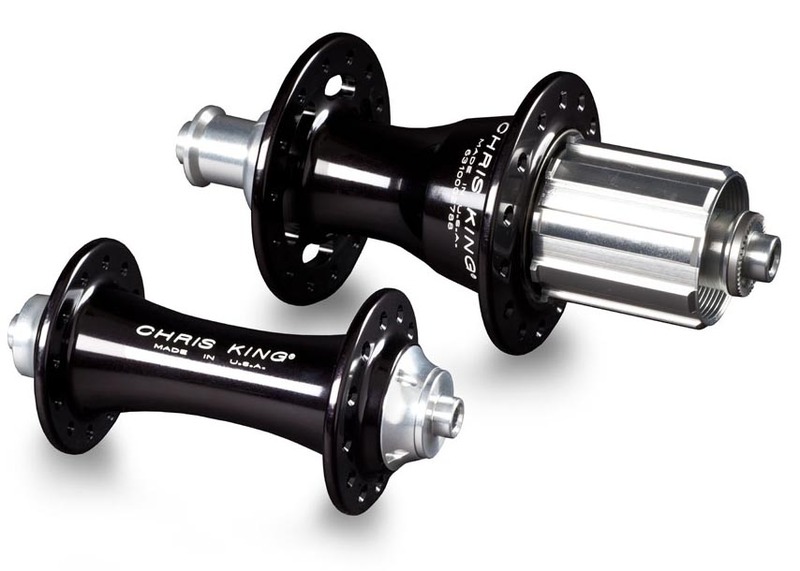 To read more about maintaining your Chris King hubs, click here. 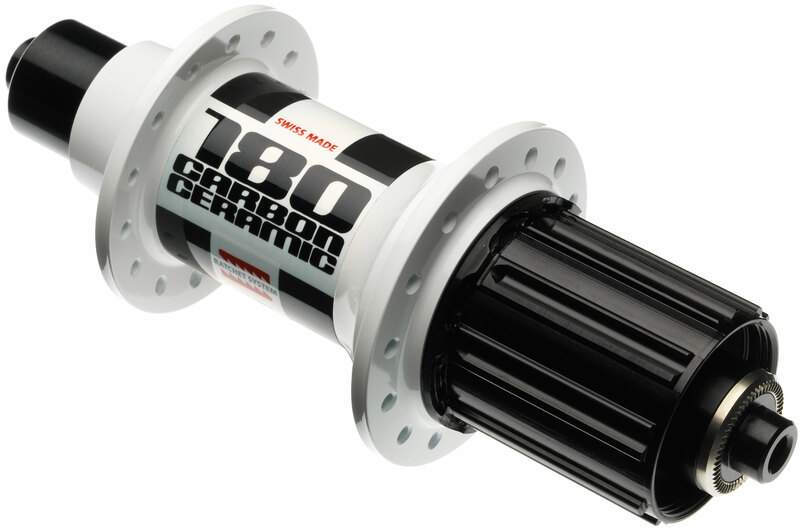 The 180 hubs are by far the most expensive we sell and it is fairly difficult to see how they justify such a steep price increase over the 240. The axles and freehub body are the same. They do come with ceramic bearings, which account for most of the (negligible) weight saving. They also come with a carbon fibre/alloy shell which has saved a little additional weight while making the shells themselves stiffer. However it is unlikely that much of the flex would be come from the shell itself, moreover the interface between the carbon and the alloy now itself has scope for flex. Nevertheless they are strong, durable, light, high performance hubs. If you wanted a pair of hubs that weight towards the Alchemy end of the spectrum but was a big more rugged, this would be a sensible choice. In terms of dimensions, the hubs aren’t that different to DT Swiss. That is, from a wheelbuilding perspective. They look quite different to other hubs – all lumpy. Unlike the 180, these are a genuine carbon shell, not just a sleeve or layer of carbon on them. It is in that that you can see the real gains and it is quite an undertaking that ENVE have made here. Carbon will offer better strength to weight, better corrosion resistance, fatigue life and you can control its properties more carefully as it is laid up rather than forged/machined. So, you are probably still thinking – why are they so much more than other hubs. Well, obviously aside from carbon fibre the internals are not the cheapest. They are DT Swiss star ratchet design. That is probably the most durable and reliable design that there is for engagement. It is also their 36t version, which is an upgrade on any DT Swiss hub. Then there is the bearings, you will have 6 of them in a hubset and they, being ceramic speed, would normally cost around £75 each, so that is £450 just in bearings. So, are they worth it? Well, they will probably mean that your ENVE wheels, and in all likelihood they will be used in an ENVE wheelset will cost more like £3k rather than £2k. They will be lighter. Require little or no maintenance, roll very nicely indeed and carry a lot of natural strength/durability. Ultimately it is about buying a set of wheels without compromise. If budget is not a concern, they are a compelling option. If you buy these hubs, as even, no degreasers or pressure washers. That is advice on any hubset I sell, but before you get out your aggressive cleaners, remember £450 to replace those bearings. 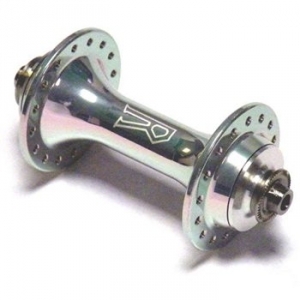 Weight saving means that a set of these hubs built up with CX-Rays onto 2.2 tubular rims would weigh approximately 1050g. Hope make a big range of hubs and are a sound UK manufacturer. We have omitted them here because they overlap with our own range of hubs but at a higher price point. There is no harm is going with Hope hubs – we respect them as a manufacturer, however if you did wish to use Hope hubs – it is worth viewing our range as well. I do like AIVEE as a company. They are made in France, use 7075 alloy shells and EZO bearings. They are light. So we are definitely off to a good start. Their bracing angle on the non-drive side rear is their most unusual feature, making for more even spoke tensions. They say it does not affect stiffness, as the tension is higher and the bracing less. I haven’t done the maths, so I cannot confirm or deny their claim, but I suspect this is not accurate given that they are on their own with the design. The bearings are fairly small and the shells quite heavily machined. The hubs are a bit on the noisy side. Beautifully made. Alloy axles, alloy bodies. Exceptionally durable, using a range of high end bearings including some SKF bearings. They have big shells, decent sized axles and decent sized bearings. It is more of a Phil Wood/Royce approach although it is all alloy body and axle design. If these hubs were even 50g lighter, I am sure they would be a lot more prolific. The weight is almost the same as the DT 350 which is the closest comparison in many ways. I would rather run a PMP hub than a 350 as I think they are more unusual and more interesting, however the versatility of the 350 and popularity of the 240s and other DT Components means that most opt for DT.